"Amazon's latest British comedy is smart, savvy, and spectacular"
Amazon might still be the little brother in the streaming content battle with Netflix, but the streaming service has been on fire of late when it comes to obtaining smart and well-written British comedies. 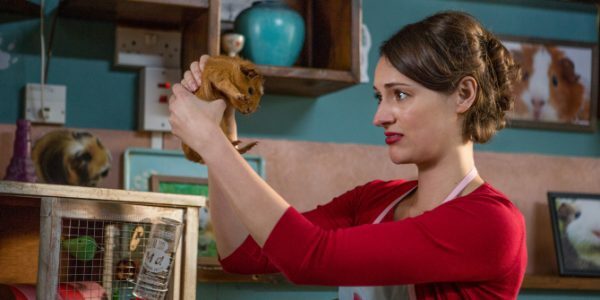 As with the wonderful British import Catastrophe, Fleabag offers up six complex and layered episodes that, in addition to being very funny, will leave you feeling as if you just watched a morality play (in the best way possible, I promise). Today's brand of elite comedy isn't simply there to make you laugh at vapid antics or prat falls, and while I still appreciate a well-crafted simple comedic story, I'm thrilled that television comedies have embraced the complexities that have made the dramas of the past several decades so amazing. And Fleabag is certainly on the list of elite comedies. Created by, written, and starring Phoebe Waller-Bridge, the series follows an average woman without a name (referred to only as Fleabag within the press materials) as she navigates life in London, including running a cafe following the loss of her best friend and business partner Boo (Jenny Rainsford), hooking up with several guys (which is treated simply as a facet of her life while also hinting at a deeper uneasiness at her actions) and interacting with her sister (Sian Clifford), brother-in-law (Brett Gelman), father (Bill Paterson), and stepmother (Olivia Colman). But what sounds like a fairly straightforward story is, as is often the case, much more complex that what it appears on the surface. Unsurprisingly, the show works as well as it does thanks in great part to Waller-Bridge's impeccable work as the series lead. Within the short six half hour episodes that make up the show's first season, the characterization of Fleabag is exceptional. As our narrator (the story is told from Fleabag's perspective), we must trust her reading of the events at hand as true, which, as show's like Mr. Robot have shown lately, is always a risky proposition for an audience to undertake. But there's a charm to Fleabag where the audience cannot help but feel for her and trust her. We laugh along with her more funny exploits and cringe when she makes poor choices. There's even room for judgment- toward her opinion of her "evil" stepmother, her criticism of her sister, and her seeming inability to commit to her long-time boyfriend (who, to be fair, definitely isn't right for her). Through it all, Fleabag remains an incredibly interesting character to observe. There's a great deal going on with her underneath the surface, and Waller-Bridge does great work in crafting the story and allowing the audience to see Fleabag's inner turmoil and pain lurking just under her cheery and sarcastic exterior. The rest of the show's excellent cast balances out Fleabag, offering added depth to the character by showing us the world she inhabits. Sian Clifford and Brett Gelman are standouts, and I would watch an entire series focused solely on the marriage between Claire and Martin. The sisterly relationship between Fleabag and Claire rings particularly true, and I couldn't help but recognize some interactions I've had with my own sisters in their slightly combative nature. It's a fine line between an exasperated, yet caring, sister and a nag, and Clifford finds the perfect balance with Claire. Gelman has become a master at crafting complex characters who manage to intrigue and repel the audience at the same time (his work as Hamish on Comedy Central's Another Period included), and that ability is on display here as well. Bill Paterson's Dad is the perfect blend of skittish non-confrontational father and the traditional put-upon man surrounded by women, and Olivia Colman absolutely slays the role as Fleabag's perfectly twisted stepmother. Fleabag may not be escapist comedy in the traditional sense, but at the end of the six episodes I found myself eager to spend more time in that world. To see where the characters go from the season's fairly explosive ending. There's no word yet on a second season (however, with British shows, renewals are rarely handled with the speed that occurs with shows in the US), and seeing as the show was adapted from Waller-Bridge's award-winning Edinburgh Fringe Festival play by the same name, there may not be plans to expand it beyond a single season. But, should there be a second season, it will have a lot to live up to. Fleabag premieres, in its entirety, on Amazon Prime on September 16.